The Elder Scrolls Online: Summerset is the second Chapter of The Elder Scrolls Online. It is an expansion set on the main island of Summerset Isles and Artaeum. The Chapter includes an all-new zone packed with adventure, the ability to join the Psijic Order, a new crafting Skill Line related to jewelry, a new Trial, and a new storyline. Summerset is not included with ESO Plus and cannot be purchased from the Crown Store. Certain promotional bonus content was available with Summerset; see the Queen's Bounty Pack and Collector's Edition for details. A large new zone, Summerset. Explore Artaeum, the island sanctuary of the Psijic Order. An epic main story quest line, concluding the Daedric War narrative. Join the mysterious Psijic Order for the first time in an Elder Scrolls game. A brand-new Psijic Order combat Skill Line. A new Jewelry Crafting Skill Line. Cloudrest, a new 12-player Trial. A new tutorial, and a free player house for new characters. New collectibles to earn, including pets, tattoos, outfit styles, and furnishings. All-new group PvE challenge, Abyssal Geysers. New styles and sets, including three new crafting sites. Summerset Standard Edition: For new players, this version includes the base game and the Summerset chapter. 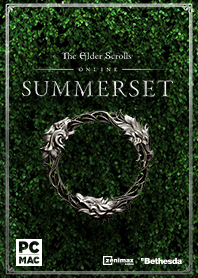 Summerset Digital Collector's Edition: For new players, this version includes the base game, the Summerset chapter, and Collector's Edition bonuses. Summerset Digital Upgrade: For existing players, this version includes the Summerset chapter. 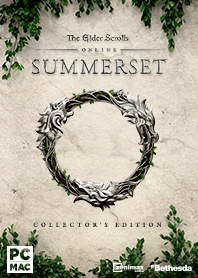 Summerset Digital Collector's Edition Upgrade: For existing players, this version includes the Summerset chapter, and Collector's Edition bonuses. Summerset Physical Collector's Edition: This version includes the base game, the Summerset chapter, Mephala Statue, Razum-Dar's Journal, Map of Summerset, and Exclusive Steelbook Case. The Elder Scrolls Online Collection: The bundle includes the base game, both Morrowind and Summerset chapters, four DLC game packs: Imperial City, Orsinium, Thieves Guild, and Dark Brotherhood, and a Palomino Horse mount. This page was last modified on 24 February 2019, at 01:34.